A classic French car in Amsterdam is a head turner. Here, they ride around in the things because they work on the principle of 'if it ain't broke, don't fix it'. 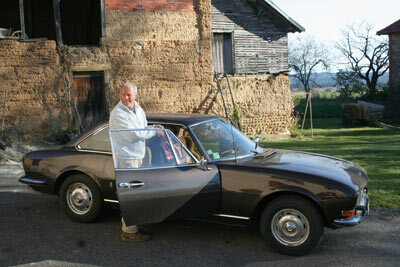 After a lot of procrastination Perry finally bit the bullet and put his classic Peugeot 504 coupé up for sale. It had been gathering dust rather since we only drove it once every couple of weeks. We contacted Jan Tinga who, knowing exactly what he was buying, agreed to buy it back. Unfortunately the going price for a classic car is not what it used to be, so she went at a loss. Still, there will be a happy, trendy art director driving her around Amsterdam again soon! Da Bonks in da house! Caroline's best mate, Ylonka, a.k.a. 'Da Bonks' hit Puydarrieux in February. This was her third visit, so she felt right at home. We soon had her sawing logs, pushing wheelbarrows and meeting the locals. This time it was Ernest, the retired village carpenter. His grandson, Damien was there too. All sorts of dogs, ducks and chickens run around the place and Ernest has the most wonderful mess of a workshop. Tools, machines and assorted piles of wood everywhere. A setting that cries out to be captured on film. One day. Monsieur Maumus, a neighbour living just behind the church, came to invite us to join his family for the tue cochon, the slaughter of a pig he has been fattening since the Spring. 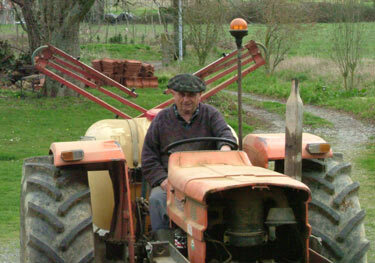 He arrived on his tractor, something one sees little of in the city! The following Saturday, we arrived to be welcomed by a large group of family and friends. Handshakes all round and then to business. 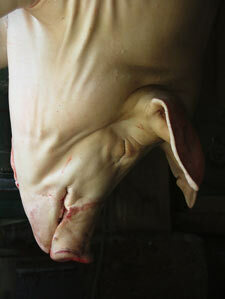 The pig was hung up and drained of its blood (an important ingredient in the boudin). Then the pig was lowered into a special bath where it was pealed of its hair with hot water and had its hooves removed. The grandchildren taking part in the process. This really is a family affair. Once cleaned, the carcass was cleared of the digestive system and sawn down the middle. There it hung for two days, to settle, before being cut up into its separate parts, each with a specific use. Only the brains and the teeth are thrown away. We then all drove down to the local river and washed out the intestines and stomach. These would be used to skin the sausages, paté and boudin. 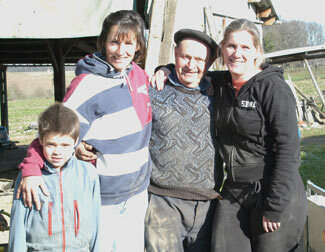 We returned to the farm and were invited to freshly-made crêpes and dessert wine. Conversation soon flowed with tales of the old days and some good old-fashioned country gossip. 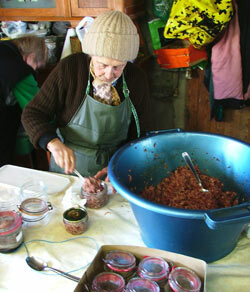 Sausages and boudin were stuffed , paté was minced and packed, rollades were rolled and two huge hams set in salt. We ate a very special boudin that evening, with conversation full of the event and the images we captured of a dying tradition. A selection of the photos we took during the two days can be seen here. Not for the squeamish perhaps. Our old staircase to the back of the house was as rotten and flakey as a cream cracker, so needed replacing. Perry got the chainsaw to it after an hour of mucking about with a hammer and chisel to little effect. 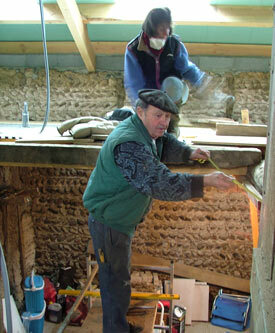 Ernest the carpenter came to measure and pretty soon we had a new staircase installed, made from old oak we found. Loads more things happened but you can read and see it all in the Our House section. We are looking for sites to make a reciprocal link. © 2007 Perry Taylor and La Baguette Magique, France.